What did Galileo ever do to you? I ask this because some of those who write about Galileo on the internet seem to have a real grudge against the guy. A personal grudge – judging from the emotion in their writing. Now I am not saying Galileo was perfect – he was as human as anyone else, perhaps more so. I read a few biographies of famous scientists these days and I am really pleased modern biographies are not hagiographic. They generally present the subject “warts and all.” The scientists are human – often very human. Personally ambitious, spiteful and jealous. (Just like scientists today – I have often said we could make an excellent soap opera based on the day-to-day life in a New Zealand scientific research institute). These human presentations really do underline the fallacy of considering scientists and science as somehow inhuman, lacking in emotion. Like robots. They help make the science, and their discoveries, real, human and interesting. Science is actually a very messy process and the more readers get presented with this reality in these biographies the better they will understand the process. But why should the reader of today personally feel a grudge against Einstein because of the way he treated his first wife and child, or against Newton because of his ambition, superstitions, jealousy and other personal failings? Even worse – why should the historian of science bear such a personal grudge – especially as this distorts presentation of their subject? Yet when it comes to Galileo this seems to be the case. Some self-proclaimed historians of science are taking sides. They wish to blame the victim for his persecution by the Inquisition. They will present Galileo’s human faults at great length, while ignoring completely the very human interactions within the school of cardinals, within the Vatican and inquisition. They ignore the political realities of the Catholic church of the time which influenced Pope Urban’s reaction to Galileo and his judgement by the inquisition. And the same thing with the science. Almost inevitably these people concentrate on Galileo’s scientific mistakes (eg his tides argument). Instead of objectively presenting the facts of the controversies over the Ptolemaic and Copernican models of the solar system at the time they insist on taking sides. 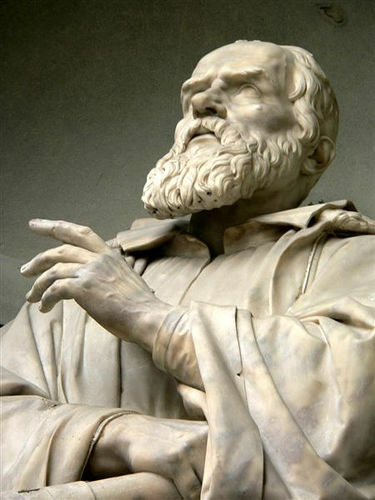 They rehearse the arguments of Galileo’s opponents (eg “we don’t feel the earth moving,” there was no orbital parallax observed for the fixed stars – interpreting this as “non-existent” parallax, and not “not yet observed”) while completely ignoring Galileo’s often extremely informative replies to specific criticisms. They present a picture implying that supporters of geocentricism had undeniable evidence. Accepted by everyone except Galileo. And implying that Galileo had no worthwhile arguments supporting a heliocentric model at all. In these discussions I have been told that geocentrism was the scientific consensus at the time and was well supported by the existing scientific knowledge. Even told that a committee of “scientists” had ruled so – see Historical fiction. (The “committee of scientists” turned out to be a panel of consultant theologians asked by the Inquisition to make a judgement – see Historical fiction for the text of the brief consultant’s report and members of the panel). Another claim is that geocentrism was a “well established and strongly empirically supported theory” – implying Galileo had no business arguing against it. When I pointed out that was actually not so, that the geocentric model required a number of ad hoc adjustments, not empirically supported, to achieve its ability to predict planetary motions I get told that it was not meant to be an “explanatory” model. Well, yes. We know about its instrumental success for navigators and astrologers. But why attribute “strong empirical support” to the model when this was not the case? Well, obviously so that any minor problems of the alternative heliocentric model could be used to discredit it. And then these modern critics also ignore Galileo’s demonstration of the over-estimation of stellar sizes due to an optical delusion in naked eye observations and how reduction of these effects produced much more distant stars and hence minimisation of parallax. All because I argued Galileo’s case! You sort of wonder where that has come from? And what exactly about “Modern way of life” is Galileo being blamed for? From my perspective it seems to come from within their own mind and ideology because I certainly don’t pick up those messages from current biography’s of Galileo or descriptions of his scientific contributions. It seems to me rather than “demythologising history” they are in fact attempting to create a myth – Galileo as the dishonest fraudster. Perhaps even highly immoral. Suppressing and distorting data, ignoring the arguments against the Copernican model. And even seeming to argue that the geocentric model should really not have been displaced. Last year in Bias in the history of science I discussed Maurice A. Finocchiaro’s book Retrying Galileo, 1633-1992 . This provides the history of the Galileo Affair as it has been debated over the last almost 400 years. And these presentations have certainly been controversial. Partly because of limited access to documents in the early days. But also because of ideological positions (for and against the church). Some of the ideological controversy continues – just do an internet search for Galileo and his persecution. See how much of the electronic space is taken up by religious apologists. Their blaming the victim approach is alive and active today and probably is responsible for diffusion of some of their arguments into the academic discussion of the history of science. One certainly has to be aware of ideological and emotional commitments when judging the statements of those writing on the history of science. Whatever – the long history of the Galileo affair controversy, and the different sides taken, certainly provide plenty of ammunition for anyone wishing to find apparent authoritative support for their own prejudices today. But why should they have the prejudices they do? I came across this interesting article in Physics Today – Science controversies past and present. Interesting because it puts in context the current public controversy over the science of climate change. The author, Steve Sherwood, compares this current controversy with earlier controversies about scientific ideas. Specifically the Copernican theory of heliocentricism and Einstein’s relativity theories. 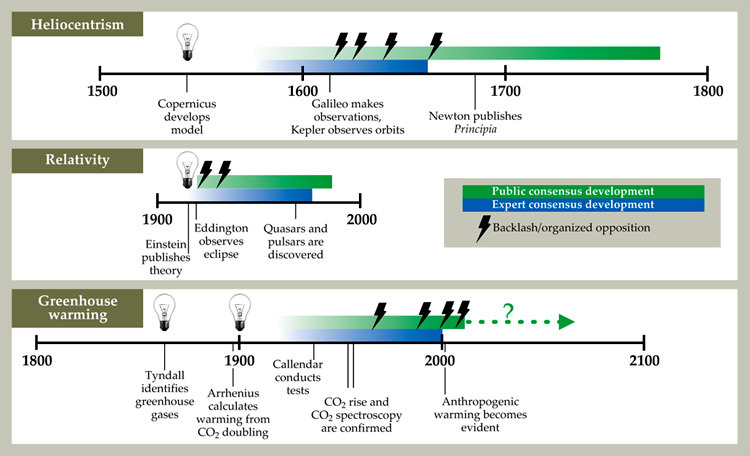 He presents an interesting graphic comparing the controversies for the time taken to get scientific consensus with that for public consensus (click to enlarge). Timelines for heliocentricism, relativity, and greenhouse warming, aligned by their dates of introduction. Coloured bars indicate the estimated times to consensus among experts and the public. Lightning symbols denote organized opposition from contrarian, religious, or political groups. The sequence of events is similar in all three cases except that relativity attained consensus more rapidly, especially among the public; it had emerged essentially fully formed, whereas the other two underwent refinements for many decades (Source Physics Today - http://www.physicstoday.org/resource/1/phtoad/v64/i10/p39_s1?bypassSSO=1#f3). Sherwood thinks that perhaps we should take this lesson from history and not be so surprised when there is an anti-science backlash. Do we have time to procrastinate? Maybe so. But I think the concern this time also derives from the possible consequences of global warming. Consequences that threaten the lives and property of many people throughout the world. Consequences which can be largely averted if humanity has the political will to act now. What is it with some philosophical and historical commenters who take sides against Galileo in his 17th century dispute with the Church? Perhaps because we now have many documents from that period (17th century) – including Galileo’s original writings, official documents from the Inquisition and the church, and the text of complaints made to the inquisition about Galileo’s beliefs and teachings. This itself can fuel different perspectives. However, I think another source of this lively debate lies in the preconceived notions and beliefs of the modern protagonists. That, to me, is the only explanation for a trend (a trend – I don’t blame all) among commenters on the history of science that seeks to blame the victim (in this case Galileo) for the affair. To claim that Galileo was scientifically wrong. That the Church was correct to suppress research into a heliocentric model for the solar system. And to threaten imprisonment for anyone holding these opinions. And, inevitably, when there a preconceived beliefs, sources are selected to confirm those beliefs. There are a few points in this which need challenging. Sometimes a historical fiction by a good and responsible author can be very informative. Of course one should always check reliable sources for details. But a good author can do a lot of that research for you. And they can add environmental and dramatic material which helps to put the details of the history into context. I recently commented (see Waking from a coma!) about Stuart Clark’s new book. It’s the first in a trilogy of historical fiction describing the history of astronomy. The book, Sky’s Dark Labyrinth, is set around Galileo and Kepler, their scientific contributions, personal lives and their treatment by the church and society. Having finished reading the book I can recommend it. It’s well written, informative on the scientific history and provides good images of the culture of the times. Recently some people of a historical bent have criticised my articles on Galileo. So I guess I may now be criticised for reading historical fiction after this revelation. But any such criticism will be irrelevant as I always do try to check details with reliable sources. I am surprised at some of the criticisms I have already had. Perhaps I shouldn’t be as there are clearly some people who have motivations for misrepresenting Galileo and for criticising the status he has today. I commented on this before in The Galileo myths. One Galileo myth I have heard came initially from a local theologian. He twisted and squirmed (as they do) to justify the church’s treatment of Galileo. In the end he actually made the claim that Galileo based his own heliocentric position on faith and that the Church based their geocentric one on the science! That Galileo was in conflict with all the scientists of the time. This came up again recently when a commenter on another blog repeated this claim and told me that the church had consulted a committee of “scientists” in 1616 who confirmed that heliocentricism was scientifically wrong (as well as being theological heretical). I think the theologian may also have been using this to justify his claim. (Galileo was initially investigated by the Inquisition in 1616 as a result of complaints he held the opinion of a heliocentric universe. However, the trial and conviction for which he is remembered was held in 1633). The highlighting of the word theologian is mine. Still one can argue about the significance of the assessor theologians report and it always best to consult the actual documents before doing so. Therefore I have provided in full below the report from the assessor theologians. You can make your own inferences on their qualifications and reasons for making the assessments they did. You can also draw your own conclusions about the extent to which they consulted the astronomers of the time. My point on the latter is that any “committee” trying to draw an objective conclusion on this question would have consulted, amongst others, the most outstanding Italian astronomer of the time, who incidentally was also in Rome when they sat, Galileo. The source is Maurice A. Finocchiaro’s The Galileo Affair: A Documentary History. Assessment made at the Holy Office, Rome, Wednesday, 24 February 1616, in the presence of the Father Theologians signed below. (1) The sun is the center of the world and completely devoid of local motion. Assessment: All said that this proposition is foolish and absurd in philosophy, and formally heretical since it explicitly contradicts in many places the sense of Holy Scripture, according to the literal meaning of the words and according to the common interpretation and understanding of the Holy Fathers and the doctors of theology. (2) The earth is not the center of the world, nor motionless, but it moves as a whole and also with diurnal motion. Assessment: All said that this proposition receives the same judgment in philosophy and that in regard to theological truth it is at least erroneous in faith. Petrus Lombardus, Archbishop of Armagh. Fra Hyacintus Petronius, Master of the Sacred Apostolic Palace. Fra Raphael Riphoz, Master of Theology and Vicar-General of the Dominican Order. Fra Michelangelo Segizzi, Master of Sacred Theology and Commissary of the Holy Office. Fra Hieronimus de Casalimaiori, Consultant to the Holy Office. Benedictus Justinianus, Society of Jesus. Father Raphael Rastellius, Clerk Regular, Doctor of Theology. Father Michael of Naples, of the Cassinese Congregation. Fra Iacobus Tintus, assistant of the Most Reverend Father Commissary of the Holy Office. Rather an extreme discussion to be based on such a flimsy report, isn’t it? In An interesting question Thony C at The Renaissance Mathematicus responded to a comment at my post, Early history of science, with his own blog article. While it mainly discusses the nature of censorship I would like to respond to some comments he made about the Galileo affair. There is something unpleasant about excusing all the actions of a huge institution like the Catholic Church and its Inquisition and putting all the blame on an individual. Moreover an individual who is threatened with torture and sentenced to imprisonment! Soviet apologists no doubt blamed Andrei Sakharov for his confinement to the city of Gorky and Aleksandr Solzhenitsyn for his expulsion from the country. That’s the trouble with apologists – their loyalties. However, I would like to deal here with the so-called “theological solution” which Thony C presents as the real problem. Unfortunately this “crime” is usually not discussed in detail, yet apologists often wish to use it to divert attention away from the scientific issues. Was the theological problem simply non-acceptance of a geocentric model which was supposedly made factual by its presentation in the Christian bible? Was it just a matter of semantics, the hubris of including scientific questions within the domain of theology? So was it a matter of interpretation, or more correctly who should do the interpreting and how?